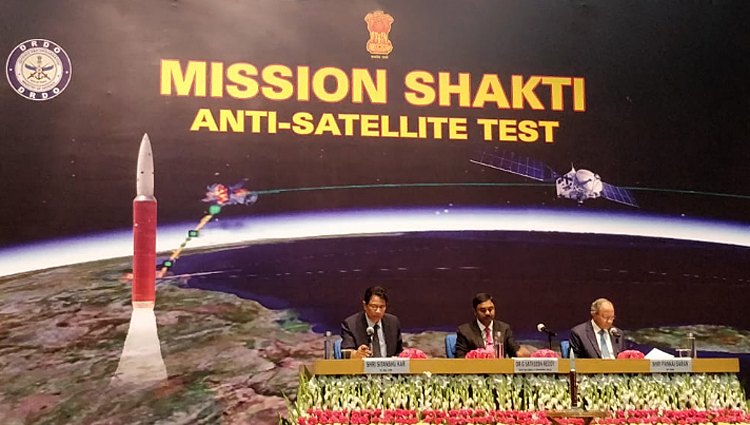 In the first detailed briefing about MISSION SHAKTI, Chairman DRDO, Dr G Satheesh Reddy and Deputy National Security Advisor, Pankaj Saran address media and explain dynamics of intercepting the target satellite at an altitude of 283 km moving with a speed of 7.8 km/sec. India has a capability to destroy enemy satellites up to a range of 1,000 km above the surface of the Earth but its March 27 Anti-Satellite (A-SAT) test was done at a much lower altitude of 283 km in order to avoid posing a debris threat to global space assets which are in higher orbits, India's top military scientist G Satheesh Reddy declared in New Delhi on April 6. Pre-test simulation has established that the 250-300 pieces of debris would decay in this lower orbit in 45 days. India also announced a virtual moratorium on further A-SAT tests, declaring that no more tests were required in the Lower Earth Orbit (LEO). "We have demonstrated our capability. The (PDV Mark-II) interceptor has a capability to neutralise satellites up to 1,000 km altitude. This covers most of the LEO satellites. We don't need another test in this orbit as of now," Dr Reddy said at a press conference which he jointly addressed with Deputy National Security Adviser Pankaj Saran. "Weaponising this deterrence capability is a decision for the Government," he added. Dr Reddy, the head of India's Defence Research and Development Organisation, disclosed that the go-ahead for the A-SAT mission was given by Prime Minister Narendra Modi in 2016. This was the first detailed briefing by India on this test, after Prime Minister Modi made a declaration about it in a televised address on March 27. Contesting the view of the NASA chief that India's A-SAT test posed a direct threat to the ISS, the DRDO chairman said the ISS is "120-125 km above the orbit of the Indian target satellite". He also talked about an area of separation creating a safe zone between the satellite and the ISS, which was orbiting above French Guiana in South America at the time of the hit. Dr Reddy emphasised that there was no danger of debris created by the destruction of an orbiting satellite hitting the International Space Station (ISS), and said that the 10-day window of risk for damage to space assets was over. The entire debris of 250-300 pieces, as estimated by NASA, would decay in about 45 days, as per the Indian simulation before the test. The target satellite, he said, was put in orbit in January 2019, and a Ballistic Missile Defence (BMD) test conducted on February 12 against an electronic target had generated valuable inputs. The A-SAT test was conducted with the PDV Mark-II, the three-stage BMD interceptor. 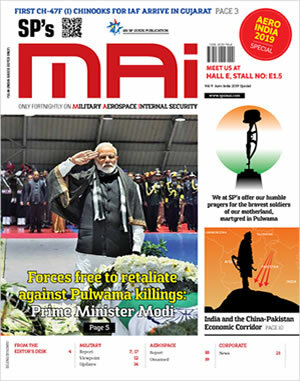 India as a responsible nation deliberately chose a much lower orbit of around 300 km to demonstrate its capability with the intent to avoid a debris threat to global space assets. "Some debris going up could be a possibility as per our simulation. But the possibility of hitting the ISS is not there. The risk of debris was for 10 days, which is over today. This is corroborated by statements by the Pentagon (US Department of Defense) and the US Department of State. The 25--300 pieces of debris will decay within 45 days, according to our simulation conducted as per international standards," the DRDO chief said. "A head-on engagement was done with the target satellite to reduce debris," he explained, claiming that some debris had already decayed. Deputy National Security Adviser Pankaj Saran too sought to play down the NASA condemnation of the test. "There were five statements from the US. The first was by the State Department. This was followed by statements by the Pentagon, Acting Defence Secretary, US Air Force Space Command and NASA. The one by the NASA chief was in a townhall meeting. The official position (of the US) is reflected in the State Department statement. That's what we're basing our response on," Saran said. He also clarified that there was no disruption in NASA's cooperation with the Indian Space Research Organisation (ISRO), including that for India's manned space misison, following India's A-SAT test. The Deputy National Security Adviser also confirmed that India had taken friendly countries into confidence before the A-SAT test. "We're in touch with all friendly partners in the spirit of ongoing cooperation. It's part of our outreach. Only four countries have issued public statements (after the Indian test)," he said. Dr Reddy said all critical technologies for the A-SAT test were indigenous. "The indigenous content was 90 per cent. All systems were developed indigenously. Fifty industrial entities participated in the programme, producing about 2,000 components. About 150-200 scientists and technicians worked on this programme for two years," he said. The DRDO chief listed four critical technologies in the A-SAT success. These are the Guidance and Control Algorithms, Strap down Imaging Infra Red (IIR) seeker for terminal stage, Divert and Attitude Control System and Ring Laser Gyro-based navigation system. The biggest challenge was precision targeting at very high velocity in the low earth orbit. "The satellite velocity was 7.8 km per second. When you acquire this target through a seeker, with the kill vehicle moving at 10 km per second, the time available (for the hit) is less than 20 seconds," Dr Reddy said. The accuracy of the hit was less than 10 cm away from the geometric centre of the target satellite. The indigenous "hit to kill" technology was used to home on to the target satellite. The advanced terminal guidance and strap down Imaging Infra Red (IIR) Seeker and Ring Laser Gyro-based inertial navigation system guided the kill vehicle to hit the target satellite atg closing speeds of more than 10 km per second. The Electro Optical Tracking System tracked the entire engagement and captured the direct hit, which was also corroborated the last image frame of the onboard IIR seeker.